Tonight’s recipe is all about getting the kids to eat their vegetables. You shouldn’t have much trouble – pumpkin pie is so deliciously silky and spiced with the flavors of Fall – cinnamon and nutmeg. Okay, so we’re kidding ourselves if we think it’s “healthy” but it IS a vegetable. Let’s make some pie! This recipe makes two deep 9 inch pies or three shallow 9 inch pies or three deep 8 inch pies. Mix together the dry ingredients; sugar, flour, salt, ginger, cinnamon and nutmeg. In a large mixing bowl, beat 4 eggs. Combine the dry ingredients, pumpkin and wet ingredients by alternating their addition into a mixing bowl. Specifically by starting and ending with dry ingredients, about a quarter of each ingredient with each addition. Stir together well as you add each part. Once the ingredients are well mixed, add the vanilla and butter. Place your crust in the pie pans. 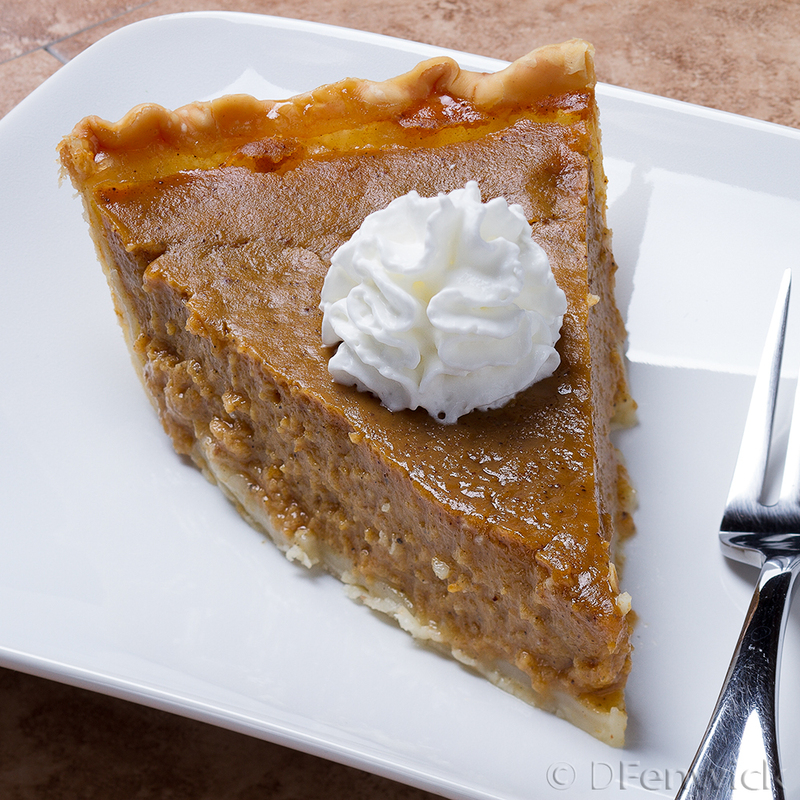 Fill each pie with the filling, keep the filling about equal so they will cook evenly. Cook on the middle rack of your oven until the custard is set in the middle. Start checking at about 60 minutes. On my oven it takes about 80 minutes for the deep 9 inch pies to cook. There’s little on a cold blustery day more comforting than peering into a bubbling pot of cheesy goodness with something enticingly dippable in one’s hand. Tonight we’re offering a simple, and delicious, bit of cheesy heaven. Although a fondue pot is helpful (and a wonderful addition to your kitchen), you don’t need one for this recipe – any small pot will do. Enjoy! Dippable suggestions: French bread; shrimp; lobster; crab; crudité. The fondue pot will eventually bring this mixture to a boil and then keep it at a constant temperature for easy dip-ability. If you’re using a stovetop pot, watch it carefully so as not to over boil or burn. Be sure to stir regularly while this is heating so it doesn’t stick and burn. 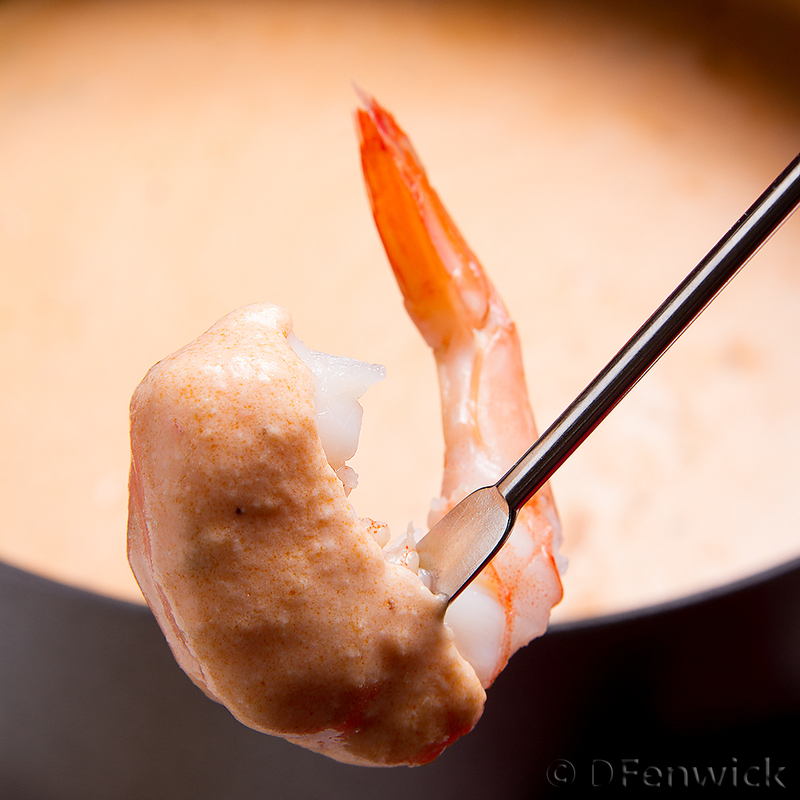 We served our shrimp with capellini pasta as the fondue can easily be spooned over the pasta as a sauce. Yum! This delicious recipe uses apples, so bountiful right now, and chicken thighs making it a low cost meal with big flavor – enjoy! Place 2 tablespoons of olive oil in your tagine and heat over medium heat. While the oil is heating, cut your chicken thighs into bite sized pieces. (You could substitute lamb if you prefer.) When the oil is hot, place the chicken into the tagine and lightly brown, cooking off most of the extra liquid from the chicken. While the chicken is cooking, peel and core your apples. Cut them into bite sized pieces. Once the chicken is browned, add the apple to the chicken, then add the chopped dates. Stir. Now add 2 cups of chicken broth, 2 teaspoons of cinnamon, 1 teaspoon chopped fresh mint and a half teaspoon each of allspice and nutmeg. Stir. Bring to a simmer and then turn down to low to medium low and let simmer for an hour. 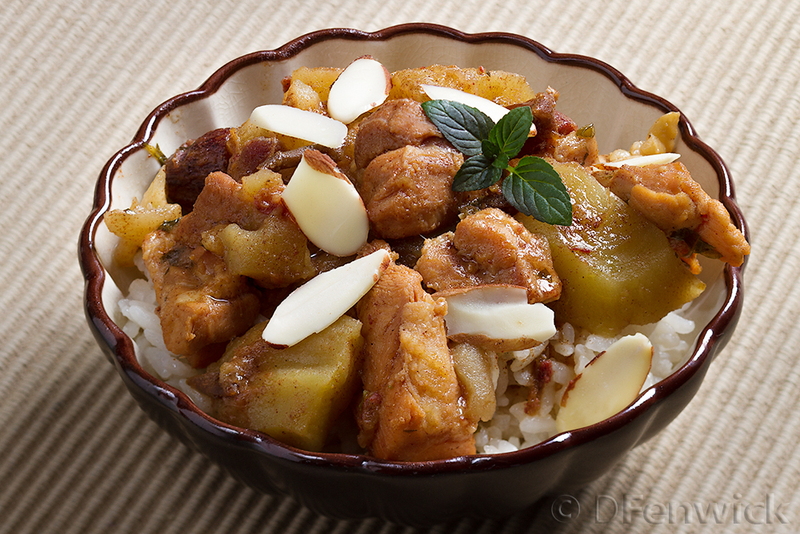 Serve over rice and garnish with sliced almonds and mint sprigs. Can there be too many apple pie variations? We think not, so here’s another spin on this all American dish. 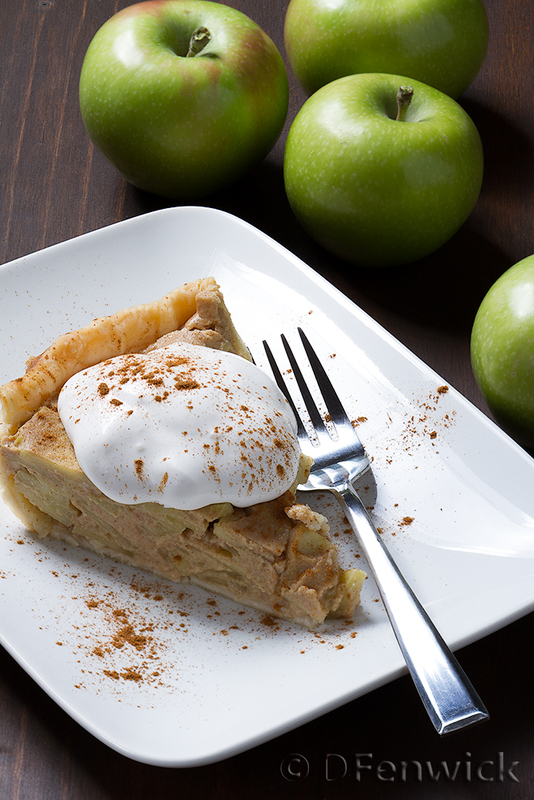 This time we use almond milk custard and tart Granny Smith apples to make an apple custard pie. Place your pie dough into a 9 inch pie pan, line with parchment and something to weigh it all down as it bakes. We used a bags worth of kidney beans that we had in the cupboard. Bake the pie shell for 20 to 25 minutes or until done. Remove from the oven and let cool (and throw out the beans if you use some too – although edible, they’ve lost their yummy factor in the baking process). Peel, core and slice your apples. Combine all of the dry ingredients, mixing completely. Put the almond milk in a 6 to 8 quart pan. Beat your eggs and add them to the almond milk. Add your dry ingredients and mix until combined and the sugar is dissolved. Add your apples. Cook over medium heat until it just begins to bubble. Turn down to low and cook, stirring frequently until well thickened and the apple slices are soft (about 20 minutes or so). Pour the apple custard mixture into your pie shell and refrigerate until cool. Serve with whipped topping and a dusting of cinnamon.